Blogger or WordPress, which one is better? I've run both two blogging platform either Wordpress and Blogger. I spent more time in Blogger platform though. In this article i would like to share my opinion about the benefit WordPress over Blogger based on my personal experience. I'm still running both Blogger and WordPress at the same time in my Blog. I got some different perspective about Blogger or WordPress comparison. In this article i would like to share my opinion about the benefit WordPress over Blogger based on my personal experience. The WordPress i am talking about is the self hosted WordPress or WordPress.org. We need to get Web Hosting service that support WordPress CMS and buy custom domain to start a blog on Self Hosted WordPress self. 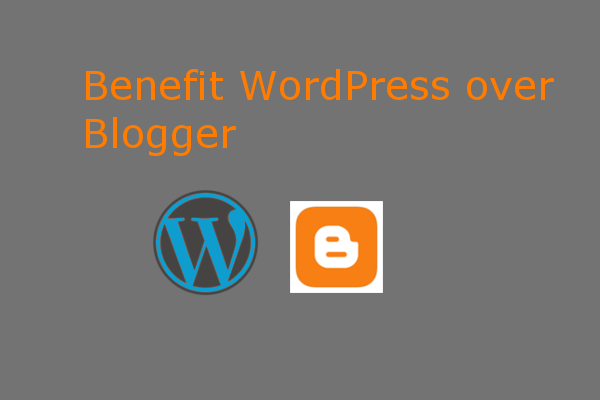 The Benefit WordPress over Blogger. Are these all true? Unlike WordPress, Blogger are completely free with Blogspot.com domain. You can start a blog in Blogger without any money to spent but internet connection. You can purchase a domain and use the custom domain in Blogger if you want to. Right now is even better, Blogger also support SSL for custom domain. Nowdays we can configure HTTPS in Blogger with custom domain. In contrary, to start a blog in WordPress self hosted we need some money for domain and hosting. Nevertheless, many blogger are using Self Hosted WordPress. The money that they need to spend for domain and hosting did not bother the WordPress user. There must be something on WordPress that make people choose them over Blogger. Is that 'something' really true? This article will give different perspective. I try to see from both perspective in current situation. Some comparison of WordPress and Blogger are made based on the 'old Blogger' feature. Blogger has improved a lot since the first time this service goes to public as blogging platform. The comparison people talked about right now might irrelevant some. There are many articles talking about comparison of WordPress to Blogger. Those article are mostly written in WordPress blogging platform. So it is obvious that WordPress has all the trophy. Some of them start the blog on Blogger at first and then move to WordPress for some reason. It seems a solid evidence that support a statement about WordPress superiority. I'm happy blogging in Blogger platform. I do not need to pay for the hosting as it is hosted by Google. Unless Google discontinue to support Blogger, my blog should run properly. I can also use custom domain with SSL support in Blogger right now. However, the story about benefit WordPress over Blogger that people talking everywhere in Internet has made me currios to try this blogging platform. Right know i run two blogs on Self Hosted WordPress. It is new experience for me. Based on my experience, what they said about WordPress benefit over Blogger are true some and doesn't really true for the other. Below is the benefit of WordPress over Blogger as many people said. I try to put other opinion as comparison. The benefit of WordPress over Blogger. Are those for real? You can move your website from one web hosting to another web hosting easily. This is true, but using Blogger platform you don't even need a Web hosting. Im term of portability, Blogger is even better. You can back up of your blog easily. And even it is very easy to transfer Blog running on Blogger from one Google account to another Google Account. So what do you think? Is WordPress is better than Blogger in this aspect? Compare to Blogger, WordPress has a lot of feature that Blogger doesn't have. For example we can customized the permalink in WordPress. Blogger only offered one permalink structure with month and date. WordPress also has a lot of pluggins that can be used depend on the requirement. In the future Blogger might give thoose feature that WordPress has. Who knows.? If you want to create a blog that against Google policy, you can use WordPress. Google has tight policy about blog content. They can wipe out your blog in a second if they found that our blog are against Google policy. This seem true, but a lot of blogger want to monetize their blog using Google AdSense. In the end of the day, they have to follow Google policy. So you buy a domain, buy a web hosting service, write a lot of articles; and you are the owner of your blog. I think this is very logical. You earned it. To be your blog owner. Practically you can write anything as long as not against the law. For Blogger, we don't buy the web hosting service Google give it free to us. But, we need to follow the Google Policy. Basically we owned the blog. As long as we have the back up, we can save our blog if Google remove our content due to Google policy violation. For me, it kind of complete ownership also. WordPress has big community support. They develop tools and plugin to improve WordPress blogging experience. This is absolutley true. Blogger can not beat WordPress in this area. WordPress is supported by many premium professional template maker. They build the code in professional way and give support n theme customization. You can pick StudioPress, Mythemeshop, ElegantThemes and other premium themes provider. Blogger is different. There are only few premium theme that we can found. So fo conclusion, i still consider Blogger fit my needs. I can use Blogger platform to support my blogging purpose. I just need a sustain blogging platform that is free and reliable. All the benefit of WordPress over Blogger doesn't make me change my blogging platform completely. How about you? How is your expereince? Share here in the comment section. 2 Responses to "Which one is better, blogger or WordPress"